At first glance, there is nary a place on God's green Earth better suited to biking than Miami. It's utterly flat, with weather that lets a cyclist pedal year-round without donning so much as a scarf in January. Its streets are wide and, for the most part, arranged in a tidy, easily navigable grid. But to ride in Miami is to be among the few and the hunted. Florida ranks among the highest in bicycle fatalities in the nation--second only to California--and in 2006, eight cyclists were killed on Miami roads; nearly 400 were injured. Such statistics are nebulous, though; many bicycle accidents go unreported. Meanwhile, as Miami totters in place, more cities are looking to bicycles as an answer to everything from traffic congestion and air quality to fitness and green transportation. Paris recently unveiled the most ambitious bike-sharing plan in history, making more than 10,000 bikes available to borrow citywide for anyone with a credit card. American towns like Portland, Denver, San Francisco, and, closer to home, Gainesville, have transformed themselves in a few short years into some of the most bike-friendly places on the planet. New York, already boasting some 200 miles of bike lanes, plans to double that number in the next two years; Chicago proposes that by 2015, every one of its three million residents will live within half a mile of a bike lane. An extensive--extensive--article on bicycling in Miami, comprehensively spanning the range from planners to advocates to Critical Mass, from cycling immigrant laborers to affluent community bike activists. It warmed my heart to see that during the last week of sub zero temperatures there were an impressive number of cyclists pedaling in the predawn frost. I passed several on Giles and a couple more going south on McDougall. What impressed me most about them was that they were not fitness enthusiasts out for a training ride but mere mortals making their way to work. And their numbers are growing. 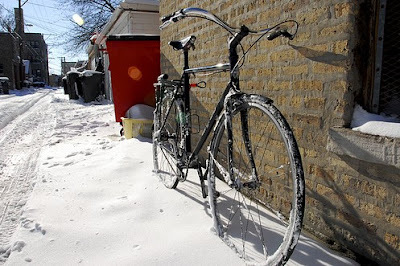 Interesting column from a personal trainer in Canada, featuring several useful conditioning suggestions for bike commuters in cold weather areas. As Bike Commute Tips Blog reader Bruce McLeod of New Jersey suggested in a recent communication, stretching is a critical activity. Especially as cyclists age. The aging Baby Boom generation--such as myself--is embracing bike commuting. Maintaining flexibility is a greater challenge the older we get. Stretch! New York City's Transportation Alternatives and the Chicagoland Bicycle Federation have been selected as the first recipients of REI/Bicycle Friendly Communities Grants of $15,000 each. This new grant fund, administered by the Bikes Belong Foundation and made possible by generous support from Recreational Equipment Inc. (REI), helps aspiring, committed Bicycle Friendly Communities become great places to ride. Transportation Alternatives (TA) will use their award to support a comprehensive citywide bike parking initiative designed to increase bike transportation in New York by giving cyclists safe, convenient places to park and store their bicycles. TA will conduct advocacy work for "parking spot swaps" and legislation mandating bicycle access to commercial buildings. The grant will also back a bike-rack design competition organized by the NYC Department of Transportation, TA, and city art museums. Chicagoland Bicycle Federation will use their funding to produce the first of a series of Sunday Parkways events in Chicago, modeled after Ciclovia in Guadalajara, Mexico, and Bogotá, Columbia. With a goal of "transforming communities by invigorating their lifelines—their streets—every weekend from June through October," Sunday Parkways promises to dramatically increase ridership in the city of Chicago by creating a car-free community celebration that other U.S. cities can adopt. This is encouraging. As an REI member, I've been disappointed to see so many California stores located in strip malls adjacent to a WalMart or Costco. Where was REI's self-proclaimed commitment to "stewardship" of the natural environment so necessary for outdoor recreation, I wondered. Are they simply a massive retailing co-op no better than their big box retail neighbors? Even the store in San Francisco, while easy enough to reach by bicycle, is located in an area poorly served by transit and features an expansive parking lot. It's gratifying to see this major retailer step up for bicyclists, a not insignificant share of its customers. Image: Web capture. 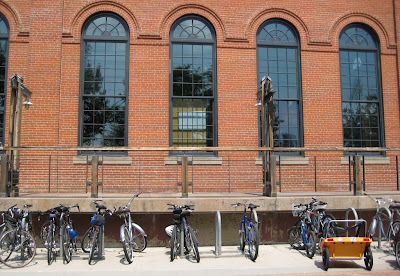 Bike racks at REI store in Denver. BART is going to introduce electronic lockers for bicycles at its stations in a new strategy aimed at enticing more people to pedal rather than drive to train stations. By late July, contractors will install nearly 200 of the lockers at six East Bay stations in BART's first big investment in the new technology. The metal lockers can be rented by the hour with the swipe of a pre-paid charge card, easing the shortage of secure bike storage places that has been a barrier to more people using bikes to reach BART. "There is a huge potential for more people to ride to BART if they knew they had a secure place to store their bike," said Tom Radulovich, a BART board member from San Francisco. "The big question is: Will we have enough of the electronic lockers to respond to the demand?" Technology continues to enhance the appeal of bike commuting. In addition to the success of swipe-card operated Velib' and Biketree, electronic card technology can increase access to secure bike parking at transit stations. Bikes left at outdoor racks are vulnerable to weather and theft. Key operated bike lockers are an improvement, but provide safe storage for only one individual--the key holder. As this article suggests, electronically operated bike lockers may be used by numerous bicyclists during a day. Image: Web capture. 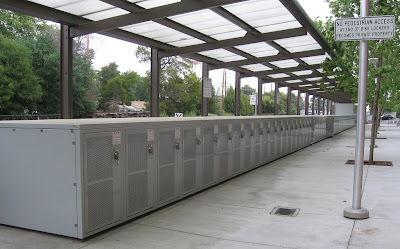 Key operated bike lockers at Sunnyvale Caltrain station. News of a cyclist seriously injured Jan. 10 by a hit-and-run driver at the corner of Lincoln and Wayne streets in Savannah has SCAD community members who commute to work and class on bicycles talking about how to stay safe. 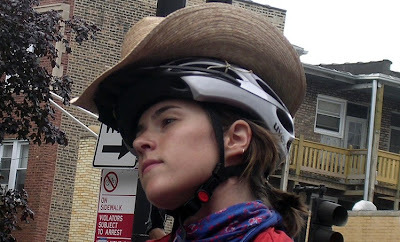 While helmet use has been at the center of bicycle safety campaigns in the United States for decades, as passive safety devices helmets should be just one component of a cyclist's comprehensive injury-prevention strategy. After all, it would be foolish to suggest that it is OK for motorists to drive on the wrong side of the road, drive at night without turning on their lights, or weave in and out of traffic--as long as they are wearing seatbelts. This article features comments from David Crites, executive director of Georgia Bikes!, and offers a good overview of how to ride more safely: stay off sidewalks, ride with traffic, keep bike maintained, communicate with motorists with eye contact and hand signals, don't drink and bike. 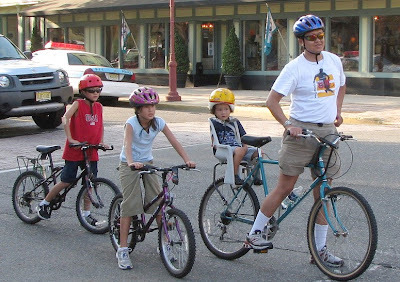 The article also offers a link to the comprehensive Georgia Bicycle Law Enforcement Pocket Guide. I appreciate the article's contextualization of helmets--they're only really effective if the cyclist practices safe cycling. For one thing, they don't prevent collisions. Among the injury prevention tactics I deploy, a helmet is about 20th on the list. I fully support any cyclist's decision to wear or not wear a helmet; and I object to any assumption that my lack of a helmet indicates recklessness. Nat Hong and Bob Barrett commute on Puget Sound by bike--water bike, that is--to their jobs in Bremerton and Steilacoom. "This is pretty hard to beat in terms of a pleasant commute," said Hong, who lives on Bainbridge Island and teaches at Olympic College in Bremerton. The drive would be 80 miles round trip. But with his water bike, the trip to work is just 12 miles--including one mile on the water. Hong, 54, rides a regular bicycle a half-mile to the water, hops on his water bike for the 12- to 15-minute ride, and has another bicycle waiting for him at Illahee State Park in Bremerton. He rides up a steep hill to his job. 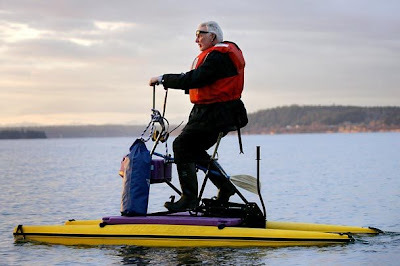 An intriguing article from Seattle, on two men who use waterbikes as part of their commute. Sounds great. Certainly not for everyone. But a clear demonstration that a commitment to self-powered transportation can overcome any obstacle. Where have all the kickstands gone? News flash: Bicycle builders are kicking around the idea of bringing back free kickstands on certain comfort models preferred by Baby Boomers for commuting and casual bike path riding. Bike industry analyst Jay Townley, a principal of the Madison, Wis.-based Gluskin-Townley Group, picked up the buzz at this fall's Interbike Show for cycling industry types held in Las Vegas. "I asked what's new and heard about kickstands and lights on comfort bikes," he said. 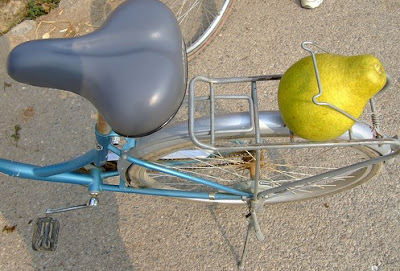 Bicycle kickstands are a thorny issue for a certain level of consumer. We're not talking about the enthusiast or triathlete in cycling togs who pumps thousands of miles a year on a $2,500 racer. He wouldn't be caught dead with a kickstand. I have kickstands on my commuting bikes, though not my road or mountain bikes. And I love having a kickstand. These truly useful accessories disappeared from most new bikes in the U.S. for about 30 years. This extensive article--slow news day?--details the absence of kickstands on American bicycles as makers chased the sporting cycling consumer. The growth of the commuter bike market appears to have inspired a new respect for the lowly kickstand, as well as other useful cycling items like fenders and lights. Finally time for bike trees in U.S.? Until a few years ago, commuting by bike was my preferred means of getting to and from the daily grind. After a few weeks of experimenting, I got the process down to a science: a permanent set of clothes at the office to change into (recycled whenever I drove in but at least weekly). 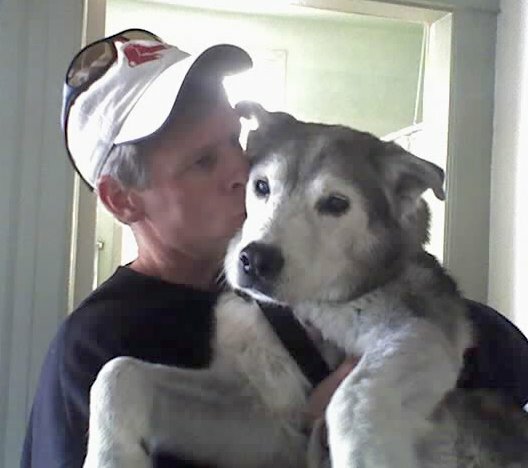 The ride to work was only five or so miles--mostly flat or down hill--so I arrived smelling reasonably sweet even on the warmest summer mornings. Then, at the end of the day, I'd head out for a 25 mile ride home, up and over the West Hills. About the only flaw was parking my bike. I had to bring it into the office and stuff it away in corner. Now, having changed the company for whom I work and locations - my Portland office is in one of those gleaming towers around town--bringing my wonderful Trek into the office isn't possible. And I'm not about to leave $4,000 of carbon and high tech aluminum wheels sitting outside just anywhere. Since its introduction in Europe, the Bike Tree concept has yet to catch on in any communities in the U.S. I'd guess the barriers might include the capital costs, maintenance expenses of the technologically dependent facility, and chronic lack of visionary creativity among urban planners. Perhaps their introduction in the U.S. will happen not at a municipal facility, but at a corporate environment: a profitable, eco-conscious, bike-encouraging company with an extensive office campus and eager for favorable green publicity opportunities. Did I hear someone mention Google? Anyone? All I can add to the benefits mentioned by this writer is the shade potential of the Bike Tree, which has to be attractive in communities with hot summer temps, like Sacramento, or Mountain View, or elsewhere. TESS VIGELAND: Imagine San Diego as one big peloton today. Thousands of cyclists are converging there for the Bicycle Leadership Conference. They'll be figuring out how to expand the bicycle market. One obvious answer: get more commuters to ride bikes to work. On that score, Portland, Oregon, is way out front of the pack. According to Bicycling Magazine, the city has the highest number of bike commuters in the country. Ethan Lindsey, of Oregon Public Broadcasting, reports on the industry that's grown up around all those riders. ETHAN LINDSEY: To many bicyclists, Portland is the closest an American city has come to getting it right. The city has bike boulevards, bike passing lanes, even bike traffic jams, and on Sunday nights it has ZooBomB. ZOO BOMB BIKERS: Alright, if you see a car you say, "car." 3-2-1 ZooBomB! 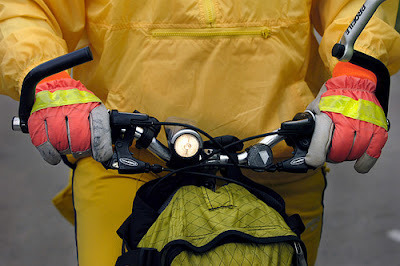 Two reports on bicycling in one week on public radio's popular Marketplace program. Maybe they think the standard business coverage--abundant foreclosures, sliding dollar, sinking stock market--is depressing their audience. This report features comments from Jonathan Maus, creator of the impressive BikePortland.org, and others on the burgeoning bike economy in the Rose City. Most important, it points to Oregon's critical funding support for bicycling facilities (the 1% minimum requirement), which clearly makes a difference. If only California did the same. "Our goal is to provide a quality, affordable means of transportation specifically tailored to each college or university community that we are privileged to be working with," Director of Operations for Collegiate Bicycle Company Erik Camp said. "At the heart, it's meant to be a fun product that current, former and prospective university members can be proud of." 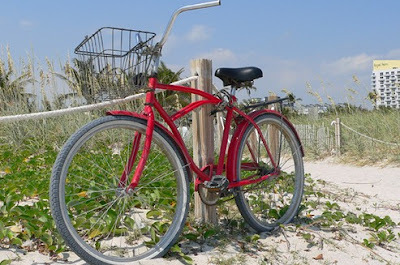 For the initial rollout, the company will be offering "beach cruiser" style bikes to the SMU community. "The classic cruiser style bike is a single-speed, coaster brake," Camp said. "These bikes are designed to be easy to use, low-maintenance, comfortable, stylish, affordable and an effective and efficient means for students and faculty alike to commute around campus and town." 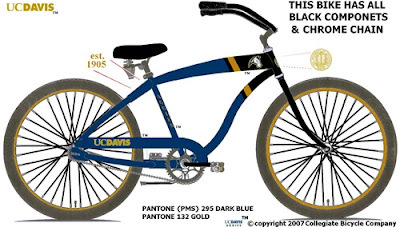 When this story appeared today, I was bothered that the first collegiate branded bicycle wasn't launched at my employer UC Davis--the most bicycling intensive university campus in the U.S. And then a visit to the company's website assured me that Davis isn't neglected, as the Aggie model in the image illustrates. If bicycling is to become a mainstream form of transportation, then we have to attract a younger demographic away from automobility. A college-branded bicycle might play a part in making cycling "cool." But what about the perception (that bicycling is) dangerous? Well, (Transport for London's bicycling and pedestrian director Peter) McBride says it's actually pretty safe. A U.K.-based radio reporter considers bicycling despite his fears, prompted by the relatively high cost of transit in expensive London. 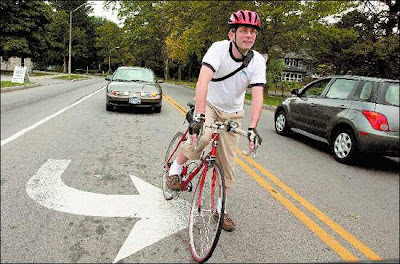 He appears to be persuaded that the risk is actually less than he believes, reporting that bicycling has increased by 83 percent since 2000 in London. Credit is rightly given to deliberate efforts by city planners to discourage motoring and encourage bicyclists. No doubt pushed by advocacy, including Critical Mass. Image: Web capture. 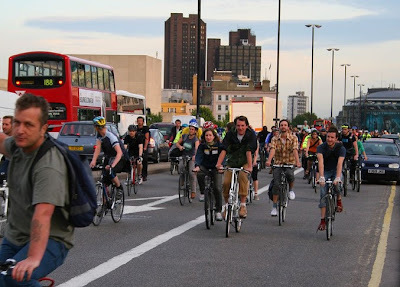 Critical Mass in London. In summertime, biking makes sense--sunshine, warmth, the body's direct contact with the elements. I love the feel of wind on my face and arms, sweat cooling my brow, and sensing the thinness of me and my vehicle compared with the hulks of cars closing in around me. I love the rapidly changing sensory amalgamation of city sights, sounds, and smells that pass as the motion of my legs propels me to where I want to go. Now, some might say, biking in this city in winter may not be the most logical, or sensible, activity. Or, it's plain stupid. But for someone like me who chooses not to own a car, it's a necessary part of my daily transportation mix. I'm not a biker for sport; I don't race. My bike gets me around Boston. When I'm not walking or taking the T (or mooching rides off friends), I'm pedaling my black Gary Fisher mountain bike from Tufts to Porter Square, from Harvard to Kendall, or from the Common back to Somerville. Even when it's 20 degrees out, in an inch of snow, or worse. 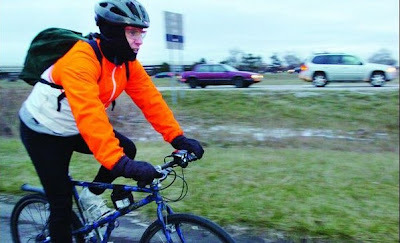 For those of us who persist with bicycle commuting during these dark, cold, wet months to the wonderment of our acquaintances--here's an inspiring article by guest columnist Ethan Gilsdorf published by the Boston Globe. Across the country, cities and towns that have created bicycle-friendly communities often have had significant returns in the areas of economic development, health and quality of life, among others, a national expert said Wednesday. And Andy Clarke, executive director of the League of American Bicyclists, indicated he thinks Martinsville-Henry County has potential to do the same. Clarke made a presentation at an event hosted by Activate Martinsville-Henry County (AMHC), whose mission is "to improve the health, quality of life and economic vitality of Martinsville/Henry County by encouraging and enabling residents and visitors alike to enjoy a more active lifestyle by developing a walking/bicycling-friendly community." According to AMHC, these changes will enhance the area's "attractiveness as a business location and as a destination for environmentally sustainable tourism and development." An extensive article detailing the points made by Andy Clarke in his presentation, on the community benefits of encouraging bicycling: business activity, tourism, health, traffic reduction. "Ghost bikes," riderless and painted white, were placed at two busy intersections in Portland, Ore., last October, makeshift memorials to two bicyclists killed when they were hit by trucks in accidents that month. This spring, at those same intersections and at 12 others across the city, "bike boxes" will be laid out on the roadway to provide a clearly designated place for cyclists, in front of and in full view of drivers, to wait for traffic lights to change. The boxes will be marked with signs and wide stripes alerting drivers to stop behind them at red lights. Portland, which has a higher percentage of people who bike to work than any other large American city, is already considered one of the country’s most bike-friendly urban centers. But the boxes, believed to be the first such to be put to use by any city in the country, will make cyclists even safer and more comfortable on the street, biking advocates and transportation officials say. Another bicycling-friendly street enhancement won by advocacy in already bike-friendly Portland, OR. The New York Times has paid considerable attention in recent months to Portland's bicycling culture. Which prompted my friend Bob, a proud resident of the Rose City and part-time Sasquatch seeker, to comment: "Hopefully their articles are making New Yorkers want to be more like Portlanders; and not making them want to move here." Besides the benefits to your health, commuting to work by bicycle can also make you feel guiltless about carbon emissions and allow you to fret a bit less as the price of gas creeps inexorably toward $4 a gallon. 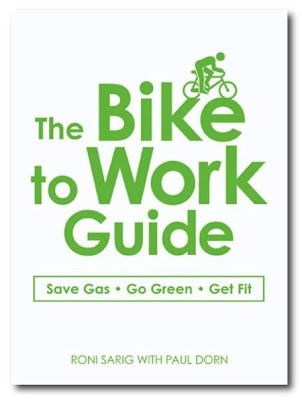 But the most important benefit to riding your bicycle to work is far more simple -- it's fun. It's more than fun, it's addictive. 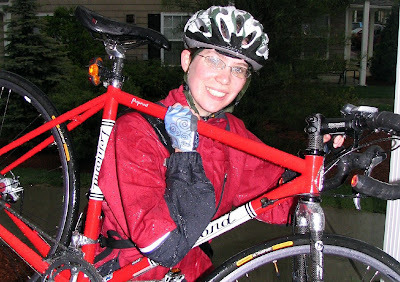 A reporter for a local newspaper takes up bicycling, gets hooked, and writes an inspiring account of her new passion in this column, and another article in the same publication, "Biking for a healthier heart." Image: Pioneer Press. Reporter Ruth Solomon. Q: When was this position created and why is it important? 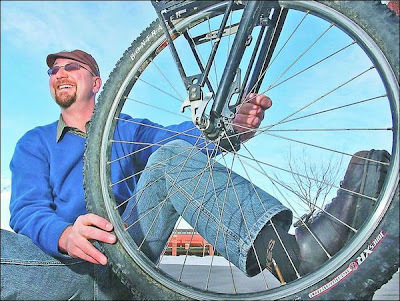 A: This position was created in late 2005... Local bicyclists raised their concerns toward city leaders on the necessity of having a person on city staff to encourage and plan for the inclusion of bicycling in the Fort Collins community. City leaders listened to their concerns by creating a part-time bicycle coordinator position. I filled the part-time bicycle coordinator position in March 2006 and since then have entered full-time status. This position is important for several reasons. Bicycling is an environmentally-friendly and healthy way to get around the city. It decreases an individual's carbon footprint and eliminates one less car in traffic. Apart from the sheer fun of it, bicycling is also a great way to wake up in the morning before work and a great way to decompress after work. Bicycling allows a person to be in the elements; to feel the wind and sun on your face and body, and to smell the air of the changing seasons. 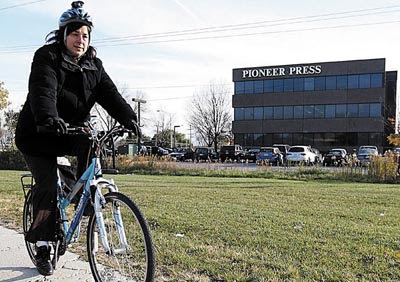 Municipal bike planners are generally the last civil servant to be featured in the pages of the local newspaper. Cops? Yes. Fire Fighters? Yes. Coroner? Yes. Bike planners? Hah! Here's an extensive conversation with bike enthusiast who happens to be the bike coordinator for Fort Collins, Colorado. A position created as a result of advocacy by local cyclists. Make riding your bike more than a New Year's resolution for losing weight, for many reasons. Yes, cycling is exercise, but it can be a very affordable, practical and sociable activity. Many people make New Year's resolutions: to lose weight, to save money, to have more fun, to get more exercise, to spend more time with family and friends. This persuasive column suggests that bicycling can help achieve these goals and more. Warm Planet Bikes opens in S.F. A valet service for bicyclists who commute on Caltrain will get an official welcome Wednesday in yet another acknowledgment by Bay Area transportation officials that pedal-power has arrived as a viable alternative to the private automobile. The service, located at Fourth and Townsend streets next door to the Caltrain Station in San Francisco's South of Market neighborhood, offers free and secure bike parking for rail commuters. The article indicates Caltrain has 2,300 bike boardings a day; in addition to hundreds of bicycles left at stations at racks and bike lockers. This is a very significant share of Caltrain's total ridership. Warm Planet Bikes began serving multimodal commuters a few months ago; the retail bike shop component opens on January 9. Kudos to the ceaseless advocacy efforts for such a facility by the San Francisco Bicycle Coalition. Students at San Diego State are fed up with a no-bicycling policy on campus. Biking is a main mode of transportation for many college students. It's a green mode of transportation. And most days, San Diego offers near-perfect weather for bike travel. But at SDSU, bikes must be walked on most of the campus. Riders can pedal only along the perimeter and on a service road that goes partially through the grounds. Many say it can be a hike from one end of the 270-acre campus to the other. Campus police enforce the no-biking rule with tickets. A group of students that is trying to get more green initiatives going at the university is taking on the policy. The group wants to reverse it and is advocating for bike paths. As an employee at UC Davis--arguably the most bicycling intensive university campus in the U.S.--I can attest that bicyclists and pedestrians can mix. Perhaps the most offensive argument against greater bike access to the SDSU campus in this article is the assertion by a campus spokesman that some bicyclists "come on campus doing bike tricks and stunts where they're jumping off benches and gliding down handrails." Uh huh. And some motorists pretend they're Grand Prix drivers and operate recklessly. Let's ban cars! Ridiculous. Image: Web capture. 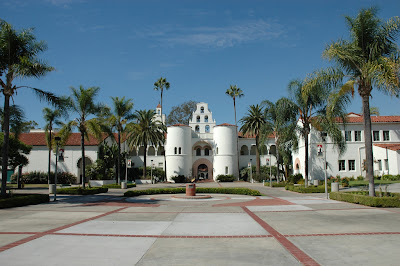 San Diego State University campus. No room for bikes? I just finished my first full season of commuting by bicycle, so I'm thrilled by the opportunity to share the experience. Although there are other benefits to commuting by bicycle, I do it for the exercise. Before I started bicycling to work, I walked, ran, swam and danced. But exercise is time-consuming. With an ever busier life, it was tough. Now it is literally a breeze. Instead of a 20-minute commute by car, I have a pleasant 35-minute commute by bike. For the first time in 15 years, I'm down to my normal weight. Six bike commuters from Greater Hartford, Connecticut, offer inspiration and motivation. An impressive amount of commentary in the leading newspaper of a state not particularly known for bicycle-friendliness. A county study shows more people are rolling around on bikes these days. As part of Marin's $25 million federal pilot bike plan, the county took a count of local bicycle and pedestrian trips to create a baseline from which to judge the program. Overall, there has been a 66 percent increase in weekday commute-hour bicycle traffic and a 33 percent rise in weekend riding, when compared with a similar count conducted in 1999. "These are encouraging statistics," Supervisor Steve Kinsey said. "They indicate that our priority focus and associated investments are improving biking and walking in our county." Marin County is one of four communities in the country awarded a $25 million Non-Motorized Transportation Pilot Program grant, passed by Congress in July 2005. (The other communities are Sheboygan County, Wisconsin; Columbia, Missouri; and Minneapolis-St. Paul, Minnesota.) More evidence that bicycling infrastructure makes a difference. Kudos to the advocacy efforts of the Marin County Bicycle Coalition. Steve Buchtel knows you can't turn around a culture of car dependency overnight. That's particularly true in Chicago's ever-growing suburbs to the west and south where bus and train schedules are erratic and well-defined bicycle routes scarce. The glut of traffic clogs roads through quaint downtown centers and jams parking spaces at the neighborhood supermarket. It creates long lines at the gas pump and in front of schools. While traffic hassles are not unique to the suburbs, they are exacerbated in sprawling bedroom communities that are not designed for pedestrians and have limited public transportation options. "In Chicago, public transit can get you pretty much anywhere anytime. In the suburbs, it can take you some places some of the time," said Buchtel, a lifelong cyclist and project coordinator for the non-profit Chicagoland Bicycling Federation. "Bikes can help fill that void." This article suggests the challenges confronting bike advocates in car-dependent suburbs.